Standard side walls come in a set of four (4) panels that zip and Velcro together to completely enclose a canopy. Standard side wall kits contain one panel with a center zipper opening. Custom side walls are available with optionalwindow panels and double zipper doors. More and more states are adopting California's strict fire safety standards applicable to vendors using canopies/tents for public events such fairs, farmers markets, carnivals, parades and other similar events. In most counties throughout California, vendors are required to use flame retardant canopies.California Palms Inc. is proud to be one of the distributors of flame retardant canopies, and one of the select, few distributors that have the Fire Marshall's approval for Multi-Color Flame Retardant Canopies. 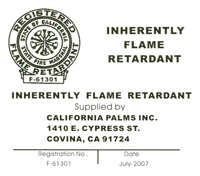 Flame Retardant -- California Fire Marshall certified! Available in a variety of different colors to choose from, at no additional cost!